Home > New on the market > Irreplaceable Nanoil Hair Oil. Perfect For Me! I’m bringing good news to all women who are looking for an effective hair care product. When another conditioner weighs your hair down, a serum for hair ends causes dryness whereas a styling product triggers dandruff – reach out for the power of natural ingredients concentrated in three hair oils. Is your hair dry? It will provide proper moisture. Is it damaged? It will reconstruct even the internal hair structure. Is it splitting? It will protect fragile hair ends. Is it falling out? It will reinforce hair bulbs and stimulate hair growth. 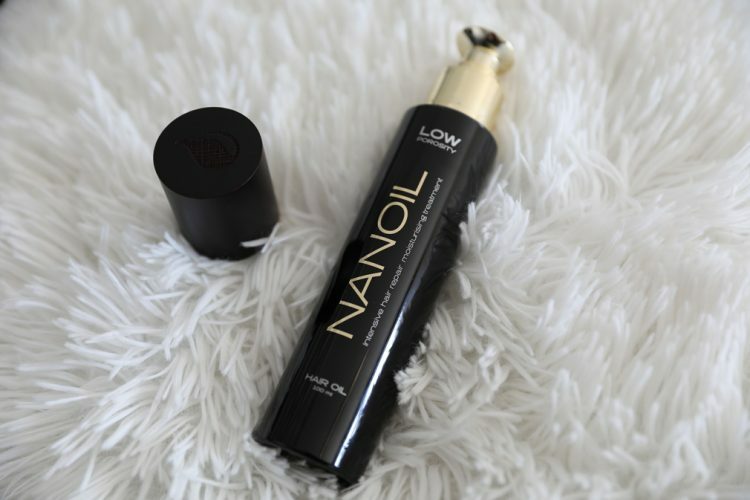 Nanoil hair oil is a novelty on the hair care market. It has excellent properties, all-natural ingredients and competitive price. Instead of a popular Moroccanoil (personally, I don’t know why it’s so popular, I don’t like it) with one argan oil and a set of silicones, we can have Nanoil hair oil with an ideal composition and lots of oils, without silicones and parabens. I guess it pays off. Three versions of Nanoil hair oil are available. Each has slightly different qualities. There’s one thing they have in common – an intensive and complex action. I’ve never had a product before that would work three-dimensionally: on hair surface, inside the hair and on the scalp. Oils are usually packed with harmful ingredients and I would be afraid to apply them to the roots. It isn’t the case of Nanoil hair oil. It’s the only hair oil that I freely apply to the scalp. I know it won’t weigh my hair down but will work wonders. My version (Nanoil for low porosity hair) ensures proper moisture, nourishes, reinforces, reduces blow-dry time, facilitates styling, boosts volume, controls pH of the scalp, prevents greasy hair, stops hair loss, enhances hair growth and protects from the roots to the ends. I wouldn’t be myself if I didn’t take a look at the list of ingredients. I thoroughly checked every version of Nanoil hair oil. Conclusion? I am surprised! I must say I haven’t had such an interesting product for a while. Its naturalness makes it stand out among other cosmetics. On the other hand, there are some other organic products – also all-natural. However, Nanoil is composed of oils and nutrients that match a particular hair type. What does it mean? They perfectly fit the external hair structure, therefore they are able to penetrate the hair and seal its protective layers. 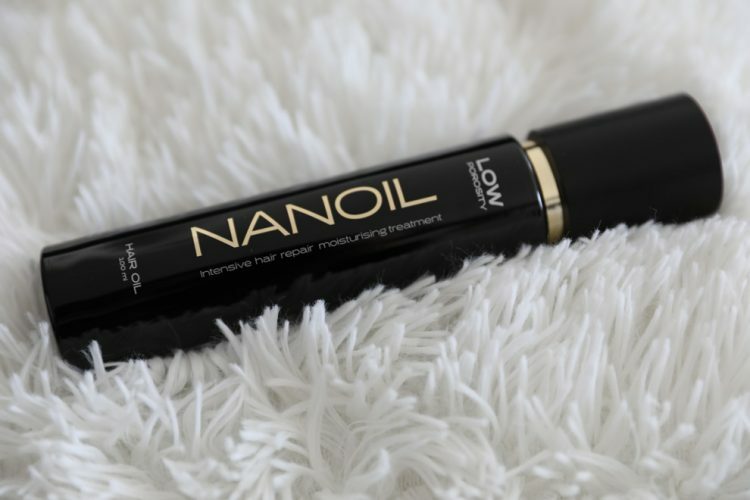 To sum up, Nanoils are the only oils that work so effectively in hair care because they are so well-composed. What ingredients can we find in each of the three Nanoil versions? 1. Nanoil for low porosity hair – cedar oil, coconut oil, argan oil, castor oil, passionfruit oil(maracuja), cupuacu butter, shea butter, babassu butter, monoi oil. 2. Nanoil for medium porosity hair – macadamia nut oil, argan oil, marula oil, jojoba oil, passionfruit oil (maracuja), coconut oil. 3. Nanoil for high porosity hair – sweet almond oil, argan oil, evening primrose oil, avocado oil, passionfruit oil (maracuja), cottonseed oil. As you can see, the compositions differ. The three products include perfectly selected oils matching the needs of hair. There are some more ingredients! Each oil contains natural UV filter, antioxidant vitamin E and two strongly nourishing substances. Kerastim reinforces the hair and prevents hair loss. Baicapil boosts hair growth; it’s a blend of soy and wheat germ extracts and additional plant substances. If still, it isn’t enough for you… Depending on the version, Nanoil contains panthenol, silk, lanolin, keratin or vitamin A. Another pleasant surprise? The consistency of Nanoil hair oils. I can’t remember ever applying such a lightweight and velvety oil. It is completely different than other oils. It’s non-greasy, quickly-absorbed and leaves the hair so fresh and soft. That’s why Nanoil hair oil is very cost-effective. Maximum 2 doses are enough for my thick and long hair, which means I’m going to enjoy my oil for low porosity hair for long months. Long months with nourished hair covered with a pleasant aroma. It rocks! I’m not going to elaborate on the bottle. You must see it, touch it. To me, it is amazing. Nanoil hair oil looks wonderful and we can be sure we pay for a solid packaging. The bottle is glass (unbreakable) and black. I really like the minimalist writing. Golden elements make the bottle look even more tasteful whereas the natural wooden cork suggests that the product is very natural and well-composed. A drop carved in the cork is also charming. I paid the standard price for a 100 ml Nanoil bottle. You will find a detailed price list on the official website of the product where you can buy different sets of the oils. Although it isn’t a cheap cosmetic, it’s the best for such a price! Surely, Nanoil is good value for money.